Prog metal dominates the top of my personal 2010 hit parade. That makes sense since I deeply love progressive rock in its many forms. Metal which is partly influenced by prog structures naturally strikes many chords in me. The three types of prog metal today are very different, covering melodic, Oriental and the more avant-garde styles. As far as I’m concerned, a lot of symphonic metal (thank you, Therion) is also laced with prog. 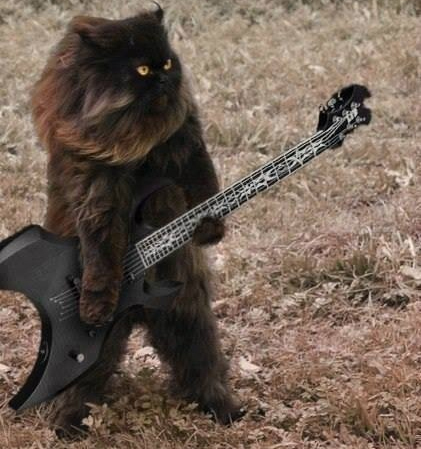 Dark Metal Cat likes anything laced with catnip. Fact: Muppets make anything more awesome. Fact: Queen is an awesome band and Bohemian Rhapsody is an awesome video. Fact: Haken’s new single “Cockroach King” is prog metal awesomeness. What happens when you mix all these awesome facts together? You get one of the most awesome videos you will ever see. I really can’t see how Haken could have visually represented “Cockroach King” any better and the nods to Queen are just too cool. Give it a watch along with their other super trippy video for “Pareidolia”. Both are off their new album The Mountain which in super quick review format (full review coming soon…ish) is a must for any self-appriciating fan of anything prog and if you don’t check it out you should feel ashamed of yourself. Enjoy!! Peace Love and Metal!!! !